My volunteer title for ONE is Congressional District Leader, which makes me a community leader! By taking on this role I found my confidence to speak up for the many issues I feel so passionately about. I have found my talent and am now just learning to embrace it and inspire others to find their talent and do the same. The power of community here in Kenya is unlike anything I have ever seen. It has been present in the rural villages, among the Kenyan business women, and especially today among the residents of Kibera. We were able to spend some time today at Carolina For Kibera (CFK) http://www.carolinaforkibera.org/, a Kenya based non-profit organization and an associated entity of The University of North Carolina at Chapel Hill—so proud to have this incredible organization from my home state!! 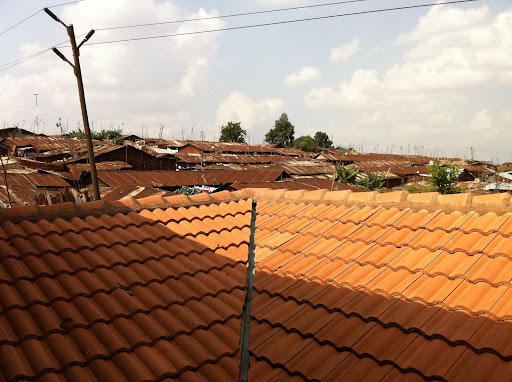 Kibera is one of the largest slums in Africa, measuring approximately 1 square mile (the size of grant park in NY), and home to estimates of 800,000 to 1 million people with 50% of those being under fifteen. The typical size home for a family of 5 (that would be my family) is 10×10 feet. Hearing those statistics you may expect that we would walk into the presumed picture of hopeless Kenyans in despair. Well I am here to clear up that misunderstanding! What I saw today were individuals invested in their community. I was able to spend the afternoon with two of the young women leaders from The Binti Pamoja (Daughters United) Center, which is perfect considering I am the mom of a 14 year old daughter. This center provides a physically and emotionally safe place for adolescent girls to explore the issues that are prevalent in their daily lives. They have peer-led groups called “Safe Spaces” where the girls use photography, drama, writing and group discussion to confront the issues prevalent in their daily lives. These leaders are trained, just as ONE trained me and now they are spreading their talents. I love the CFK tagline, “talent is universal; opportunity is not”. I believe that when we are seen as leaders then we become leaders. At my ONE events I like to suggest that we can act locally and advocate globally. My second love besides ONE is a local non-profit, DREAMS Center for Arts Education; because I believe it does for my community just what CFK does for theirs. They both exist to develop local leaders, catalyze positive change and are work to alleviate poverty in their respective communities. 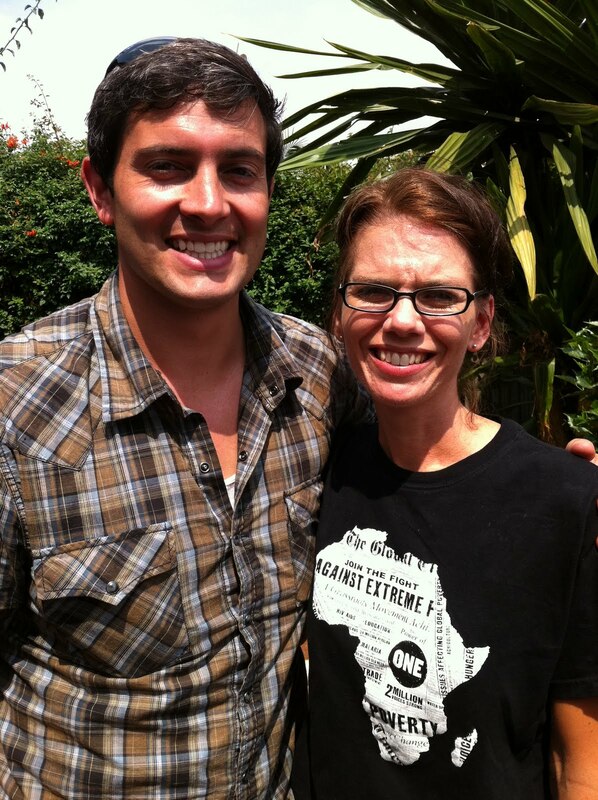 Rye Barcott is the author of it happened on the way to war: a marine’s path to peace (facebook.com/ryebarcott) and the co-founder of Carolina For Kibera. I was excited to meet him and his staff today and look forward to hosting a ONE event in Wilmington where we can show the power of community!! I am finding it difficult to put this post into words. Ask me to speak aloud how moved I was by what is happening at Amani Ya Juu (http://www.amaniafrica.org/) and I can passionately share every detail, but ask me to come back and write it in words-my page remains blank. This may be because I felt something resonate with my personal journey, but it is also because I want every reader to come away knowing that peace is happening! 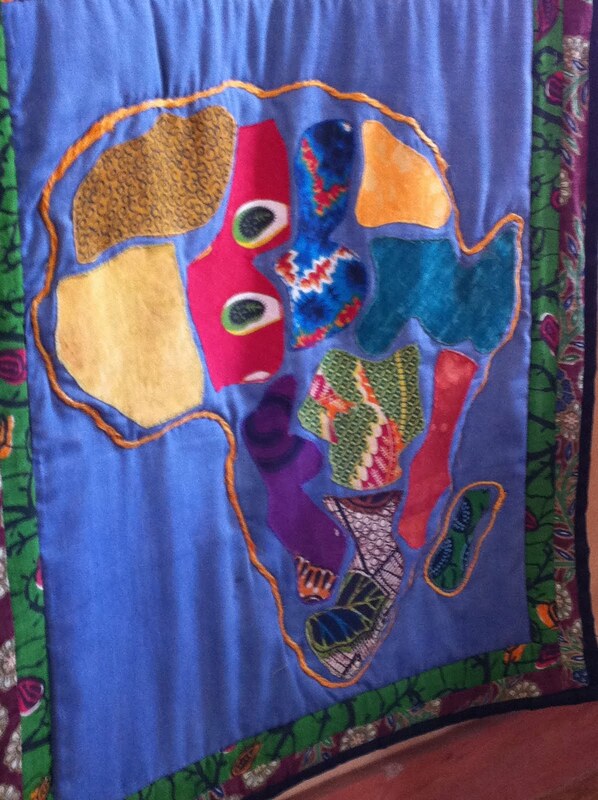 Amani Ya Juu is a sewing and training program for marginalized women based in East Africa. These women come from Kenya, Sudan, Burundi, Liberia-Bassa, Congo, Somali, Rwanda, Uganda, and Ethiopia. Think about standing in a circle of women representing all of these African countries, then think about the power they have to transform not just Africa, but the world. Together they created the unity quilt (one corner of it is pictured above) to illustrate how reconciliation is celebrated traditionally by their people. But, as you can guess they did not stop there! Their children created a quilt with all of their handprints sewn together. These children will grow up knowing nothing but love for each other. Just as I have said before moms have the ability to multiply their advocacy. The work these women are doing goes far beyond making handbags, home décor, jewelry, women’s wear, and children’s items. It is about transformation, for themselves, their children, and their continent. They demonstrate without a doubt that “together we are transformed”. This trip has placed me in a global circle of women. I have learned clearly that we are all connected and that our voice, our compassion, and our action can CHANGE THE WORLD!! Imagine—land in Nairobi after 2 days of flying; arrive at hotel to an amazing buffet at the pool with our ONE travel team and ABC News producer and cameramen; venture to room for shower and sleep by 2 a.m.; up and back to airport at 6:50 a.m. for 1 hour flight to Kisumu; greeted by the AMAZING Kayla Laserson from the CDC right off of the plane; drive 1 hour through the villages of rural Kenya for an extremely moving experience with HIV/AIDS home based counselors; load the bus for a yummy lunch and drive to KEMRI/CDC Clinical Research Center (simply wow! ); then back on the van to Kayla’s home for the honor of sharing a meal with Kenya’s women leaders (including Momma Sarah Obama!!! ); finally arriving back at the hotel around 11:00 p.m. to check some email, post some facebook, and write a small blog. You would think after a day like that I would be a zombie, but that was not the case today! I am not sure that words can describe the emotions felt by all of the ONE Moms when we pulled up at the Lwak Nutritional Center today greeted by a crowd of beautiful smiling, singing, and dancing women. I could not hold back my emotion. We all exited the bus and joined in their celebration with song, dance, and lots of cheek greetings. Whatever feeling of fatigue I was feeling was replaced instantly with joy and energy. I am still singing their words in my head which translated to “the visitors are here…the visitors are here”. Following our welcome they performed a song and then spoke words of such gratitude to US for providing a program that has given them the training needed to take on leadership roles in their community. They are called Village Reporters and they support the implementation of Kemri/CDC projects and studies. These VR’s are currently making home visits to women at varying stages of their pregnancy. In order for these vital government programs to be funded it is essential that data be collected and results be monitored. These women have embraced this leadership role. All morning I kept reflecting on my experience becoming a leader for ONE. I could see my own “coming alive” in them! 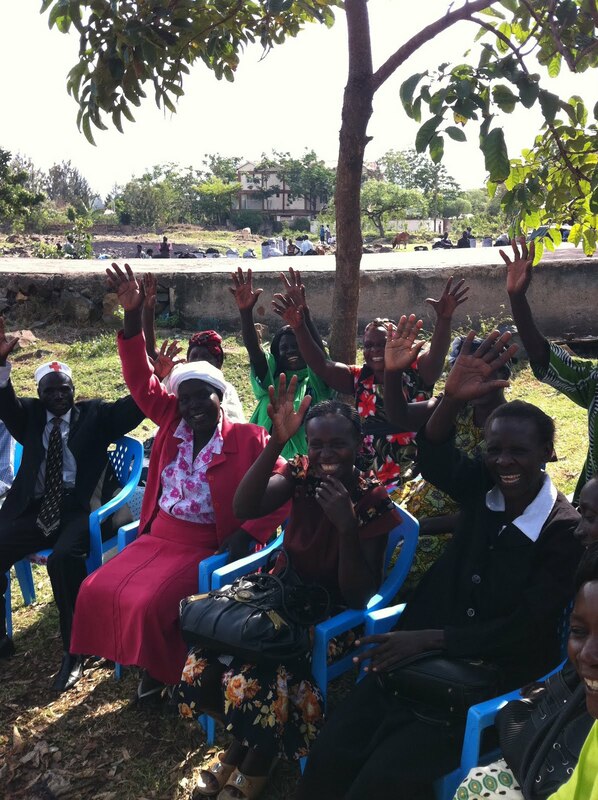 The women community leaders are not just located in the Lwak area. We also visited the women of the Dunga beach fishing community who are leaders in the conversation of HIV/AIDS in the fishing community. This group had all lost a family member to HIV/AIDS. They shared their personal stories and thanked the US supported programs that are providing members of their community with the medications needed to stay alive and healthy. Surprisingly it did not stop there. We then were taken back to Kisumu where we met the Volunteer Tuberculosis Ambassadors. This was “living proof” that funding for these programs is saving lives and building better, stronger, and healthier communities. Tuberculosis accounts for 200 deaths per hour and the treatment is a strict regimen of daily medication for 6 months! These volunteers are all former TB patients and now are assigned to someone in the community to visit every day for 6 months to ensure they are taking their medications. The patient we met is now healthy and preparing to become a TB Ambassador herself. She is going to “pay it forward”. We were taken to a celebration of former TB patients who were bed ridden (a whole tent full!) and were given the gift of a broom to “sweep” TB out of their community and off of this planet! Are you inspired yet to take action? I hope so!! We say that “it takes a village”. After what I witnessed today I say, “it takes a mom”! Only 24 hours in Kenya and I have “come alive”. I can say that with a feeling in me so strong it is hard to explain. We were given experiences today that I wish I could create for everyone I come into contact with. Honestly, I have had only a few hours of sleep over the last few days and as we wrap up this first day I am here fully awake holding the women I met today in my mind. 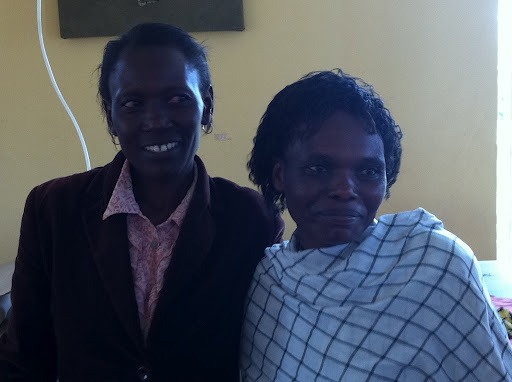 As I found myself in community with these Kenyan moms, I only kept feeling more connected. We shared stories of our kids and of the struggles we face as moms. It did not matter if they were in the rural village or a successful women working for the CDC we had something in common-we were all moms. Because of that we could listen with our heart. As I pull my notes together over the next few days I will be able to give a post in more details, but for now if I can only stress the beauty and strength that I saw in these women today will be with me forever. This trip has ignited a passion-I will be advocating now with the personal stories that I have experienced. We need the voice of moms everywhere! The women of Africa are doing their part—I have seen it. 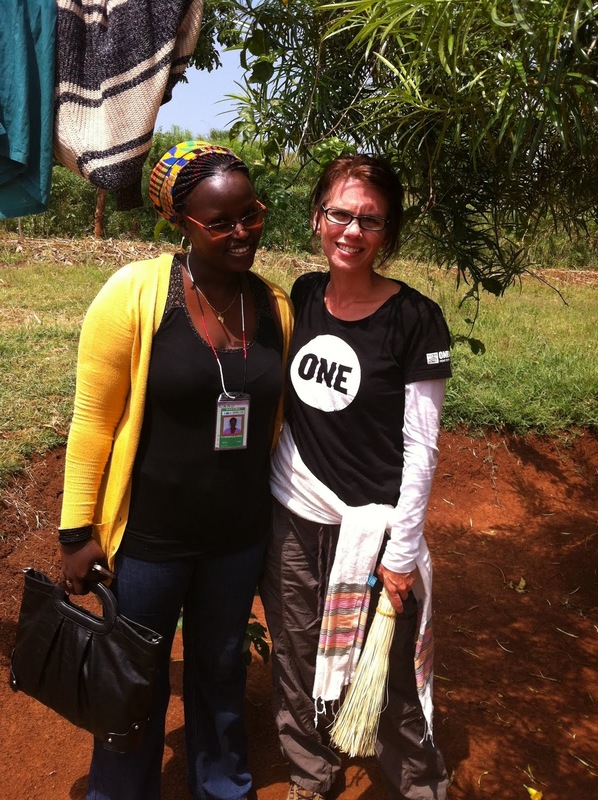 My new friend, Florence and I said today as we were saying goodbye, “together as ONE” we can create change. Part of our ONE Week with the mom bloggers we are asking you to join us from home by taking action. Every day I will post what we did along with a way you can give your voice. This action will take 1 minute of your time and I can tell you from what I saw today our US dollars are going a long way and providing these families with the necessities they need to live healthy productive lives. Last September when I took my first trip to Washington D.C. as a ONE Congressional District Leader I remember sitting in the airport watching this young professional girl pull out her laptop and go to work. Later that evening as I was in my hotel room (alone-without kids!) and called my husband. Our conversation turned to the girl in the airport. A part of me wanted to have something that was so important that I would have a laptop and work to do on it while I sat in an airport. Honestly, my self-doubt is sometimes not healthy! Today, here I sit in the Atlanta airport as I wait for my connecting flight to Amsterdam to then take me to Nairobi, Kenya and I am on a laptop working on something important. Imagine that! Something that can inspire others to learn about ONE, to learn about women in the developing world and learn what simple actions they can take to improve the lives of these women. I am free typing, not writing and re-writing, and I am doing this with the confidence that my voice is making a difference. Just sitting here I met 3 beautiful women, all from different areas of the US and the world. Our conversation took us to paying attention to the good that is in the world. They are all making a difference within their own circles and now they plan to to follow our ONE Mom trip and be a voice for all of the beautiful women of the world as ONE members! My journey has now begun and I am so grateful to have support all around me. Our itinerary is incredible and I am excited to share an overview of it here. Not only will the stories of these moms be shared on all of our ONE Mom blogs and the ONE blog, but we will also be covered by ABC News as part of their global health series. So incredible!! Daily Action: Today the bloggers will be meeting with couples and mothers living with HIV, Tuberculosis, and other infectious diseases. Using the hashtag #ONEMoms, tweet a message (or messages) you’d like us to deliver to mothers in Kenya. Once we learn that more than 11 million people in the Horn of Africa – greater than the populations of Houston and New York City combined – are desperately in need of food, clean water and basic sanitation, how can we not take action? 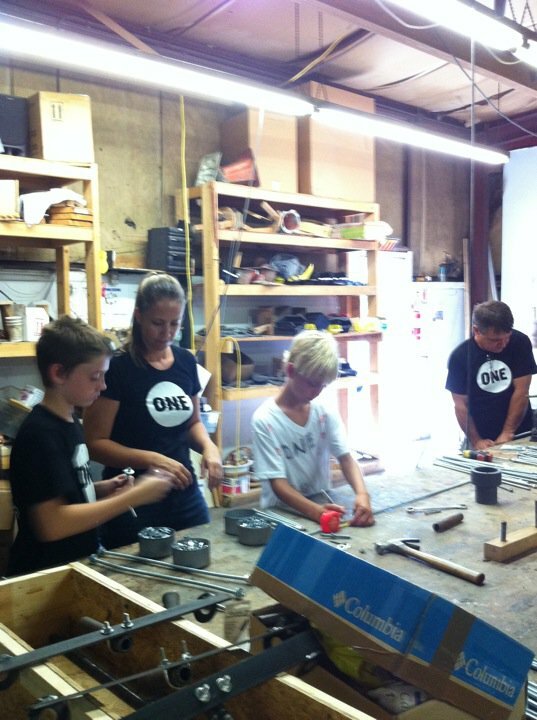 By joining the ONE movement we can be a part of the solution. Some people look back to previous droughts and question whether things will ever change. But we’ve got proof that smart aid works. In Ethiopia, millions of people will be able to survive this drought because of an early warning system that was put in place with help from USAID – and because the Ethiopian government began distributing food before the crisis hit. The number of malnourished people in Ethiopia has fallen from 71% in 1992 to 46% today. We know that growth in agriculture is twice as effective at reducing poverty as growth in other areas. So get creative-reach out to your circle-let’s spread the word! Just this week I received the best words of encouragement from the ONE communication team, my husband, my forever friends in Seattle and Indiana, AND Dr. Sipho Moyo, ONE’s African Director. They all said the same thing, “be yourself!” I am guilty of placing lots of pressure on myself to speak with clarity and respect at all times. Whether it is to my kids, the teens I work with at DREAMS, or the older adults I spend time visiting. As a mom I want my words to foster positive self-esteem, as a teen council facilitator I want to inspire, and as a friend to an older adult I want them to feel respected. 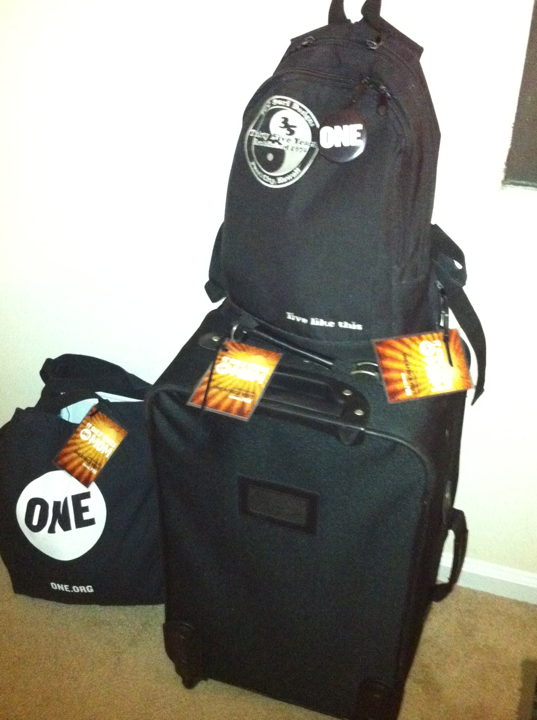 Now, I am traveling to Kenya and will be representing ONE, as well as sharing the stories of the women I come into contact with. I want to carry forth this task with authenticity, grace and the most effective words. With the incredible preparation I have received from the ONE staff I should have no doubts. I am extremely familiar with the programs we advocate for, how ONE works by using your voice—not your money, the focus of our trip to educate, engage, and activate moms around the world to us their voice on behalf of the world’s poorest, and show the “living proof” that smart aid is working! So when I had the opportunity to personally interview Dr. Sipho Moyo this week I knew exactly what I wanted to ask. Dr. Moyo is a native of Zimbabwe, has lived in nine countries and describes herself as an African citizen who enjoys the privilege of working in a multi-cultural environment. As a ONE advocate I have at times heard, “we advocate for those who do not have a voice”. In my “word fetish” mind this phrase seems to go against our goal of changing the perception of Africa. In my mind I think “Africans have a voice too”. Dr. Moyo did a beautiful job of sharing her thoughts on this subject and giving me just what I needed before visiting her continent. She said, “The implications that Africans do not have a voice can be deceiving. They just may not have as much access to use their voice. There are so many efforts that Africa is making to help themselves and the support from the west can be complimented by the efforts of Africans.” Her suggestion to be “mindful” of our words was perfect! She made reference to the fact that 70% of the population is under 34 years old and this group is looking for a hand up not a hand out. I resonated with her words that there is a bigger picture of Africa that needs to be painted. Dr. Moyo clearly adds that AID is working and the good news is that our US dollar now goes farther, but there remains work to be done. Right now there is a momentum that we need to continue to build on. Her personal words to me were to engage the people of Kenya, hear about what they are doing for themselves, and “be yourself!” I am still saying, “pinch me please”! I am a mom blogger, working at U2 concerts, interviewing Dr. Sipho Moyo, and traveling to Africa. I can only say that my heart is full of gratitude. I am preparing myself now to help paint this picture all the while being just who I am, myself! We can be a ONE mom! Understanding advocacy and how giving your voice makes a difference takes explanation. People are accustomed to helping by giving money or giving their time; whether it is helping to prepare meals, make care kits, or building schools. Being a ONE member does not require any money, and takes only a small amount of time. Because of this people often wonder how they are really helping. How does signing a petition help children dying every day from preventable illnesses in the developing world? That is what my family and I were able to answer while at the U2 concert in Miami and what I share with my congressional district as a CDL daily. Our voice does have value and hearing the support for GAVI (Global Alliance for Vaccine and Immunizations) at the June 13th replenishment conference is “Living Proof” that we can make a difference by signing petitions, making phone calls, writing/faxing letters, and sending tweets. (http://www.one.org/blog/2011/06/22/heartfelt-thanks-from-gavis-ceo-helen-evans/) In simple terms, there is power in numbers. We have over 2 million ONE members worldwide with over 36,000 of those in my home state in NC. These numbers have an impact when shared during a congressional meeting. When a letter is written by a ONE member it reminds our elected officials that we are part of an organization that educates its members as well as monitors programs it is advocating for, the governments pledging support, and the governments receiving aid. Personally I have always appreciated the bipartisan support and the honesty that ending extreme poverty will not happen overnight, the programs are not perfect, but that progress is being made. ONE is not an angry campaign. Just as we practice in our house, it is most effective to have “an attitude of gratitude”! From my experience the Members of Congress understand the importance of supporting the programs working to eliminate extreme poverty and end deaths from preventable disease. They want to know if their constituents care about these programs too. This is how ONE is effective. While ONE volunteer leaders like myself are building relationships with our Members of Congress we are at the same time educating our communities on the issues of extreme poverty. 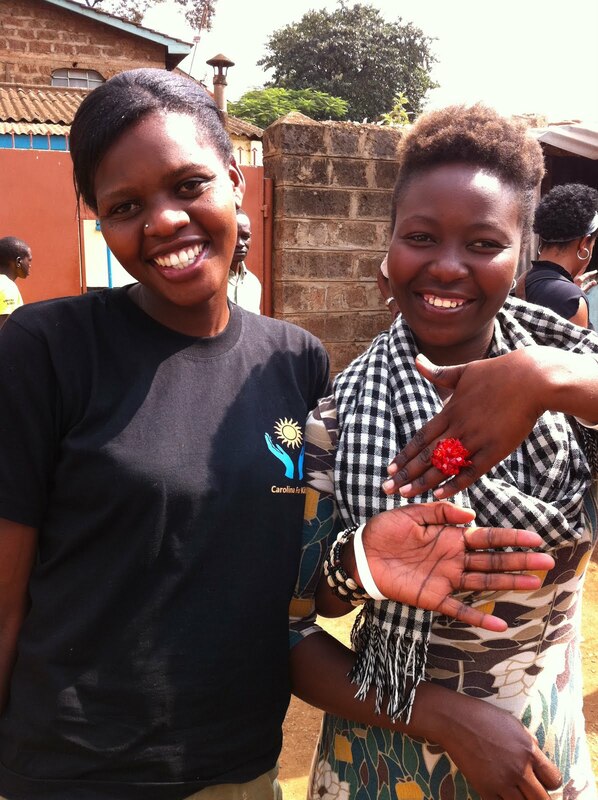 We create an awareness of the programs that have proven to be effective and how by adding their voice we can ensure that these programs continue to save lives and build stronger, healthier communities in the developing world. It is exciting stuff! 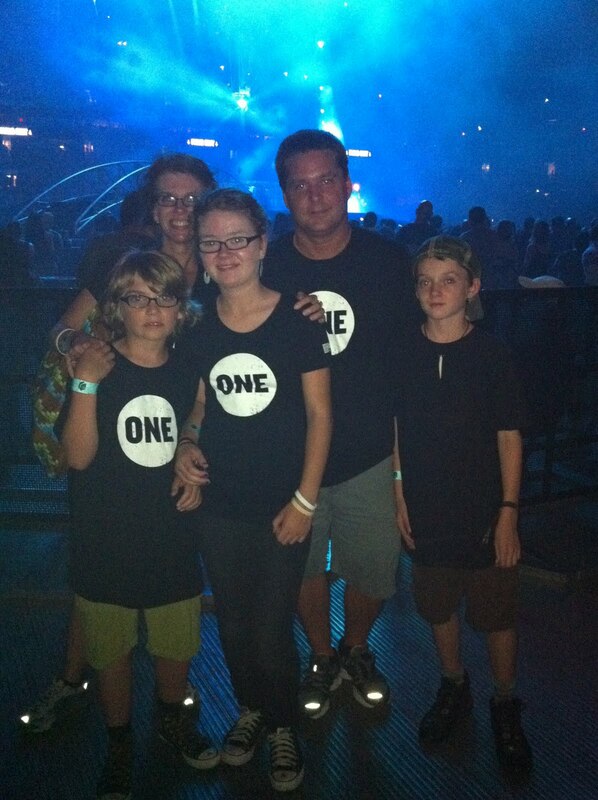 While at the U2 concert in Miami, we explained that ONE is not a charity and does not want money, just their voice and by adding their name to the vaccine petition they can be a part of saving 4 million lives by 2015. Once they heard this they were in! I love being a ONE member. It is simple, empowering, and feels good to know that we do not have to be a celebrity, a millionaire, or a rock star to help make poverty history. We can be a ONE mom (or someone who loves a ONE mom)! What can I bring to the table? Well I have to say that “coming alive” and believing that we are more powerful beyond measure is not that easy! Overcoming fears, stepping outside of our comfort zone, and embracing our life as it presents itself can be hard work. I know that I am not alone, because I have had many conversations with moms just like me. Moms who were ambitious with ideas to change the world until they discovered their way of changing the world was by tucking those ambitions away for 15 years to raise their children. When I was invited to join the ONE Moms Advisory Council I was first dumbstruck and then completely overwhelmed. After so many years out of the professional world would I be able to handle this. This was a group of established social media moms and I was just learning facebook. There is a quote by Randy Pausch, “Be good at something; it makes you valuable…have something to bring to the table, because that will make you more welcome.” I was at a point where I felt like being a mom was all that I had to bring to the table. Becoming a ONE CDL changed that for me. I understood clearly that this was a volunteer position, and that made it safe for me. This was an opportunity for me to explore something that I had always dreamed of learning. Nursing was not my passion, but I always felt obligated to my degree. My first Regional Field Director, Lauren Conn and my current RFD, Sara Donaldson have given me the encouragement and the tools needed to re-discover the ambitions that I had tucked away so many years ago. I am not sure they are aware of the gift they have given me! Today as I learned how to place the “I am going to Kenya” badge on my blog I had another moment when I realized that this is all really happening. I had a ONE meet-up with my ONE Wilmington members this morning and I found myself making rounds around the coffee shop from all of the patrons wanting to learn more about ONE. I am a ONE advocate. It comes natural. It makes me valuable. It is what I can bring to the table. I invite you now to click on the “I am going to Kenya “tab and follow me along on the trip! My post will begin sharing this experience from getting a passport, vaccinations, and our family working the Miami U2 concert in between. I will discuss the books I am reading to prepare myself as well as continue to share how I am growing personally. Through this I hope that others will become involved ONE members, who learn the issues and see how empowering it is to take action. Thank you for being a part of the journey!